A valid hunting license is required for Alabama residents between the ages of 16 and 64. Non-residents 16 years and older are required to purchase a hunting license. Hunting licenses are renewed annually. The Hunter Education Certificate will also be required for ALL hunters born on or after August 1, 1977, unless hunting under the “supervision required” license. For additional information on hunter education requirements in Alabama, go to http://www.outdooralabama.com/hunter-education-alabama. Alabama residents 65 years of age and older are exempt from purchasing hunting licenses (exceptions: Fur Catcher, Federal Duck Stamp, HIP (Harvest Information Program) decal). Residents must have their Alabama Driver license, Alabama non-driver ID or other proof of Alabama residency with them while hunting. A valid fishing license is required for Alabama residents between the ages of 16 and 64 who fish with rod and reel or artificial bait. This license is also required to fish with hook and line (cane pole) outside your county of legal residence. Alabama residents 65 years of age and over are exempt from buying fishing licenses provided the resident has on his/her person while fishing an Alabama driver license, Alabama non-driver ID or proof of permanent Alabama residence and age. Fishing licenses must be renewed annually. Residents of Alabama may also apply for and buy lifetime fishing licenses, which require no renewal. All non-residents 16 years of age and older must have a license to fish in the state of Alabama. This license is required for fishing in any public waters regardless of tackle used. Non-residents can also obtain a freshwater or saltwater fishing trip license good for seven (7) consecutive days. Fees vary according to the type of license purchased. For hunting and fishing license price information, visit the website of the Alabama Department of Conservation and Natural Resources at www.outdooralabama.com. You will be required to present a valid Alabama driver license or non-driver ID as proof of residency. If you do not have an Alabama driver license or non-driver identification card, additional information will be require. For specific hunting and fishing license residency requirements, please visit http://www.outdooralabama.com/residency. 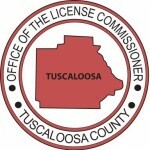 Hunting and fishing licenses can be purchased at any Tuscaloosa County License Office location, as well as online at the website of the Alabama Department of Conservation and Natural Resources www.outdooralabama.com. At this site, you can also print replacement hunting and fishing licenses, get rules and regulations related to hunting, fishing and boating, as well as information on Alabama’s state parks and more.